I was first introduced to Sound Devices when I purchased a 744T recorder, which remains in my kit to this day as a sound effects and field ambience recorder. 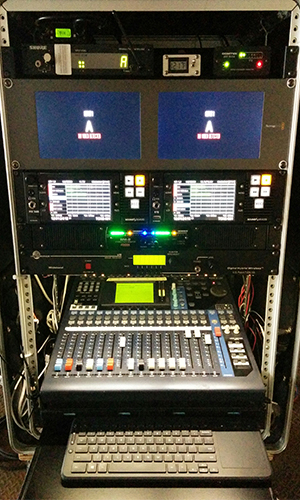 Since buying my first 744T, I have purchased two 6-Series mixer/recorders: the 664 and the 688, along with its SL-6 powering and wireless system accessory, and two rack-mount 970 audio recorders, running in group mode. I didn,t even consider any other machines when purchasing each of these recorders. Sound Devices, reliability and support is insurmountable. Being able to record to various media simultaneously and then simply hand it off to anyone using a device that has a USB port is one of the prime reasons I chose these recorders. Add in the screen size, good keyboard implementation, and the Internal Sound Report generator, and it is easy to see why I choose Sound Devices. When the 688 came out, it changed the way that I approached my job. I was using another portable recorder, and while it didn,t necessarily need replacing, I kept thinking about Sound Devices, MixAssist capabilities as I started doing more shows that featured large multi-cast member shots. With so much ad-libbing going on, there were more and more occasions when I was reluctant to fade anybody out. I used the 688 for the first time on Fear the Walking Dead, and sure enough I had five or six people in a vehicle that were largely ad-libbing. This was a perfect opportunity to see what MixAssist could do. To its credit, it was flawless. MixAssist helped me balance the levels of everybody seamlessly, with no perceptible phasing. I was incredibly impressed with what it was able to accomplish; it made an instant believer out of me. When Sound Devices introduced the SL-6 powering and wireless system for the 688, I was excited to add it to my rig. The SL-6 now has my bag down to just three cables: Timecode cable, Comtek BST 216-75 transmitter cable, and Comtek transmitter power cable. This has lightened and neatened up the bag considerably, while also streamlining control. The SL-6 has made it easy to use three Lectrosonics SRb receivers with just a single pair of coax dipoles, all of which I absolutely love. I am getting great RF range with this system. The 688 paired with the SL-6 is so capable that I am now much more inclined to just leave the cart in the truck and use my portable rig whenever I see that we are in an environment that isn,t conducive to a cart, or when I know we need to be able to move around much quicker via bag. For example, on my current production, while shooting on very large exterior desert sets, I used a 688/SL-6 combo mounted on an ATV, instead of struggling trying to use a sound cart. This proved to be invaluable. It,s also made insert car setups a breeze! In addition to my Sound Devices gear, my rig includes a Lectrosonics Venue system, Sennheiser and Sanken boom mics, and a wide selection of other microphones. Sound Devices, extremely reliable products have improved my workflow significantly since I started using the company,s products. The company,s customer service is also absolutely amazing. You can't ask for anything better. The one time I did have a technical issue, they had me up and running again immediately. These products are fantastic and incredibly well designed, implemented, and proven. Going forward, I plan on sticking with using only Sound Devices for all of my future projects.